The set-up of the pilot screw-press installed and operated on a farm in Żurrieq. A research project is presently ongoing aimed at developing a holistic solution for the management of manure and slurry from livestock on the Maltese Islands. Although solutions have already been proposed, these focus solely on the liquid manure fraction. PT Matic Environmental Services Ltd., a leading environmental services and waste management provider in Malta, through a project funded and managed by the Malta Council for Science and Technology (MCST) and the Governance for Agricultural Bioresources (GAB), is working to provide a solution that addresses both the liquid and solid fractions of manure and the huge challenge in managing the accumulation of this biomass in a sustainable manner. The current scenario in which livestock farmers face limited disposal options for the nutrient rich manure on the available land surface – to adhere to current EU and national legislation – while inorganic fertilisers are being imported for use in agriculture, is creating competition for land and some understandable tension within the sector. The ever-increasing production costs together with increased competition of products from abroad is a deterrent to the sectors and is a main factor that is discouraging livestock farmers. These issues together have conceived the main objectives of PT Matic’s research project which are to: study the nutrient value of manure produced on Maltese livestock farms and the potential of transforming it into a resource without putting pressure on water bodies; the production of good quality water that can be used by livestock farmers as potable water or irrigation water; research into technologies that remove from the current nitrogen cycle any excess that is being produced; limiting the GHG emissions by proposing treatment protocols that will process manure within a short time frame from time of generation. 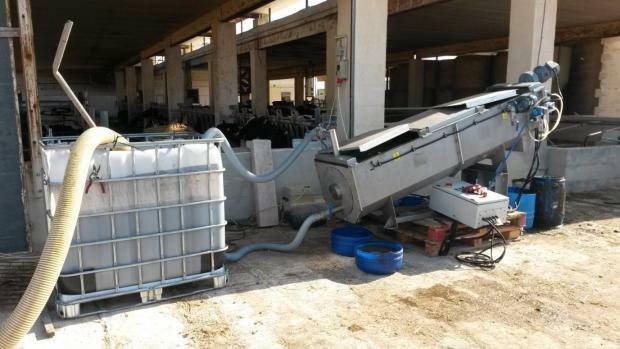 PT Matic conducted a pilot study over the summer of 2018, whereby a screwpress which serves to separate the solid manure particles of up to 150 μm, was installed and operated on a cow and pig farm operation located in the limits of Żurrieq. Samples from the resulting liquid fraction (effluent) were sent to a simulation laboratory in the Netherlands where they were tested for potential nutrient extraction through a process known as ammonia stripping. The ammonia which has been stripped from the manure in this process is converted into a fertiliser with the potential of replacing artificial fertilisers currently being used in agriculture. An added benefit is that this process also generates water which can be used either for irrigation or for general use on farm, although adequacy is yet to be determined. Although research is still on-going, results obtained so far are promising. The use of fertilisers from processed manure is not yet well established, the European Commission is presently in the process of developing criteria by which certain manure-fertilisers may be used like mineral fertilisers in nitrate vulnerable zones within the context of the Nitrates Directive. The outcome of this criteria development should be available in 2019 following contribution from several member states. As part of the same research, PT Matic collected three different samples of solid manure generated on three different livestock farms (sheep, poultry and cow), and were sent for pilot testing in a specialised laboratory in Italy. By means of a test rig, the potential of utilising Pyrolysis as a technology to generate biochar from manure was investigated and tests are still on-going to determine the quality of the biochar generated from the three different manure samples. Apart from the fact that this technology has the capacity to remove Nitrogen from the cycle without producing dangerous emissions, it can also process other biomass that are currently competing for precious space at the limited landfill facilities. The potential for treatment of other waste streams makes this treatment technology a resilient process that is highly favourable when considering local economies of scale. Biochar, which is the main by-product of Pyrolysis, generated by means of very high temperatures and in the absence of oxygen, has been the subject of multiple international studies. These have shown that it can be used as a soil improver and can be spread on land as part of a package that includes other types of nutrient rich or bulking substrates. On a global scale, biochar uses include: bedding material, feed additive, soil amendment and fertiliser, filterbed (water filtration); replacement of peat (nursery industry), additive to compost/sewage sludge to accelerate composting and sewage treatment processes, and fuel. Presently there is no EU regulation that allows the spread of such material on land, however the European commission is in the process of revising the Fertiliser regulations whereby it has stated that “…[the Commission] intends to include additional component material categories in the annexes, to keep up with technological progress allowing the production of safe and effective fertilisers from recovered, secondary raw materials, such as biochar, ashes and struvite”. This revision is in the process of being finalised and is very encouraging for this proposal. A feasibility study, which is the main outcome of this research project, shall be presented to Malta Council for Science and Technology with the aim of implementing a solution that is feasible within the local scenario. This project ‘Proposal for the treatment of livestock manure and slurry by means of Pyrolysis of the solid fraction and maximisation of the fertiliser potential in the liquid fraction as part of a holistic solution for the Maltese Islands’ is financed by the Malta Council for Science & Technology for and on behalf of the Foundation for Science and Technology, through the Scheme for the Provision of Proposals aimed at a Holistic Approach to the Sustainable Management of Livestock Manure and Slurry within a Circular Economy Context.